Kansas City is growing as a destination for international immigrants. Over the last five years more than 15,000 foreign born residents have come to call Kansas City home. 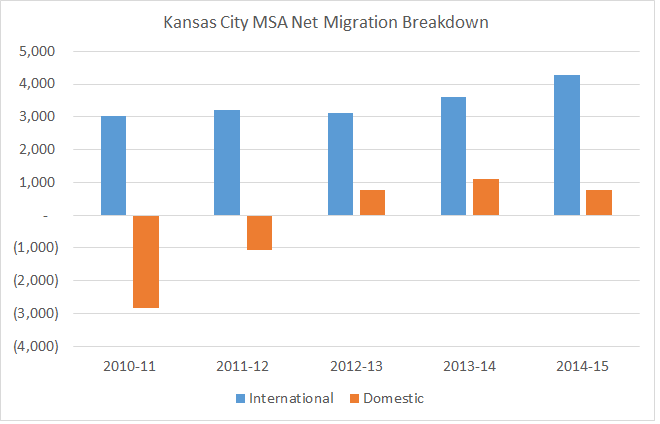 In fact, international migration growth has accounted for virtually all of Kansas City’s net migration growth over the past five years, as the region saw net declines in domestic migration between 2010 and 2012. While immigration helps keep our population growing, it can also be instrumental in boosting the economy. According to Inc. magazine, 13 percent of the U.S. population is foreign born, but this population accounts for over one-fourth of all new businesses. Fortune magazine tells us that more than 40 percent of Fortune 500 companies were founded by foreign-born individuals or their children. The numbers ring true in Kansas City as well. Here, the foreign-born population is relatively small, just 6 percent of the total population, but this population accounts for 13 percent of all local small business owners. Gateways KC is a new initiative designed to create a more welcoming community for immigrants and, as a result, strengthen the regional economy. The Kansas City metro area is one of 20 Gateways for Growth communities selected by a national partnership between the New American Economy and Welcoming America. Creating a broader understanding of the economic value immigrants bring to our region. Helping postsecondary institutions attract foreign students and encourage students to stay in the community and create businesses and fill jobs after they graduate.. Helping immigrants become more engaged in and contribute to civic life. For more information, visit the GatewaysKC or New American Economy websites. ← Job Creation from Startups: How does the Kansas City Region compare?